Vintage jewelry is about much more than nostalgia and romance. Every piece is a miniature work of art that you can wear. 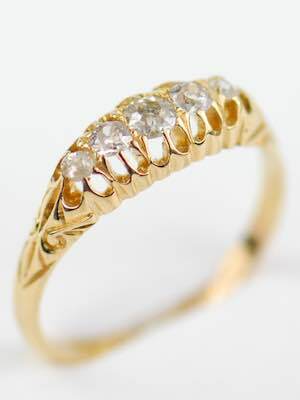 Each vintage engagement ring or bracelet or necklace is unique and has a story to tell. Discover why you should buy a vintage engagement ring. 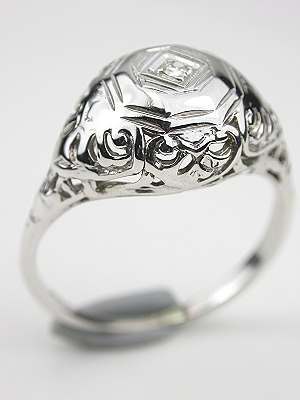 This vintage engagement ring with scroll design boasts an attention-getting domed top. 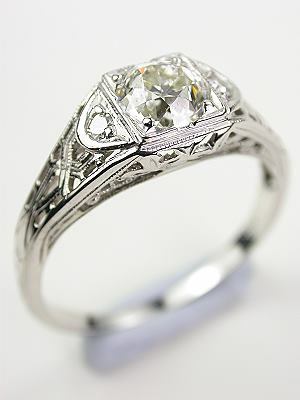 Constructed of 14k white gold, the band of this vintage engagement ring catches the eye with its pierced scroll work. A double-tiered octagon is carved into the top setting. Nestled inside a multi-tiered rhomboid is a round single cut diamond. Rated G in color and VS1 in clarity, the diamond weighs 0.02 carats. Circa 1930. 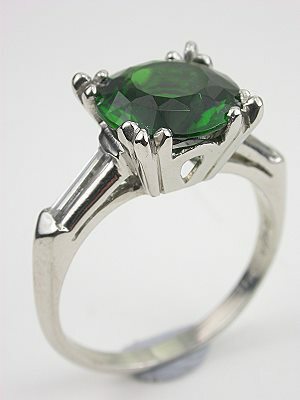 This hand wrought Retro vintage ring with airline design features an outstanding 3.33 carat chrome tourmaline. The chrome tourmaline in this vintage ring is set off by two straight baguette cut diamonds. The diamonds are channel set, one on each shoulder. Classic in design, this platinum vintage engagement ring makes a powerful, sophisticated statement. From the Topazery Earth Collection. Circa 1950s. A classic style mounting glitters softly with 10 old style single cut diamonds which are bead set on the shoulders of this vintage engagement ring. In this vintage engagement ring, two baguette cut diamonds flank each side of the GIA certified 0.71 carat, J color, VS2 clarity round brilliant cut diamond. The hand wrought mounting is in 10% iridium platinum. She'll definitely say "Yes!" when you surprise her with this romantic vintage ring! Circa 1935. 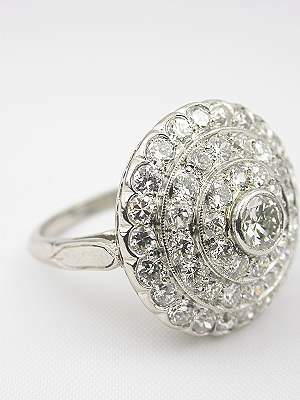 Diamonds and platinum create a glittering orb of light in this vintage diamond ring. 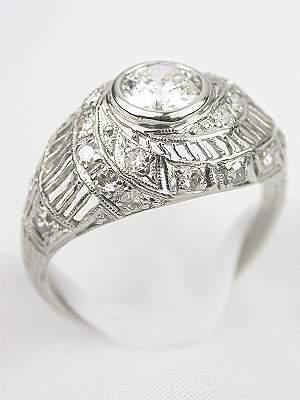 A total of forty-eight old style full cut diamonds wind their way around a center old style round brilliant cut diamond in this vintage diamond ring. This center diamond has a color rating of F, a clarity rating of VVS2 and a weight of 0.29 carats. The combined weight of all the diamonds accentuating this vintage ring is 2.04 carats. 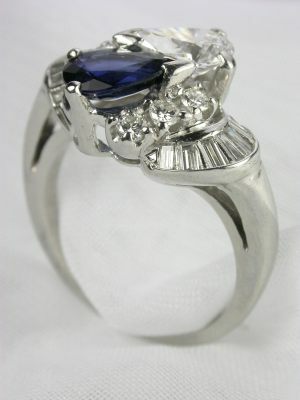 This showstopper design makes an unusual engagement ring! Circa 1930. 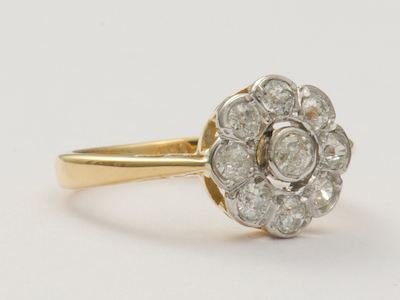 A cluster of diamonds spins around this vintage engagement ring like the petals of a perfectly designed flower. Scalloped edging adds a soft touch. The yellow gold band of this engagement ring is polished to a golden sheen. Details: Vintage. Circa 2002. 18k white and yellow gold. Old European cut diamonds; 0.93 carats. A round solitaire diamond and understated metallic features in white and yellow gold make this vintage engagement ring a classic. 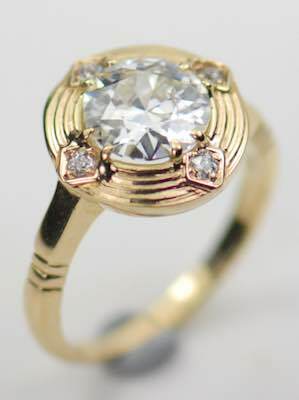 The golden glow of this vintage engagement ring's band warmly contrasts with its round solitaire diamond. An integrated 18k white gold top plate adds to this striking effect. The mounting has a playful buckle appearance to it. Details: Vintage. Circa 1930. 18k yellow gold. Round diamond; 0.33 carats. Old style round cut diamond accents set the compass points for this vintage engagement ring's out-of-this-world diamond centerpiece. 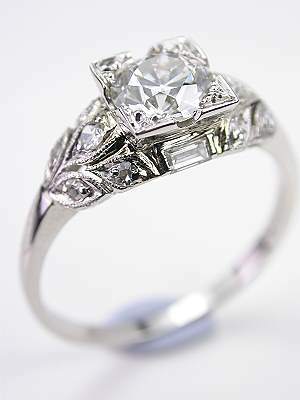 An old European cut diamond solitaire sits at the center of this vintage engagement ring's universe. Old style round brilliant cut diamonds mesmerizingly spin around its axis. A 14k yellow gold setting adds a warming glow. Details: Vintage. Circa 1930 or later. 14k yellow gold. Old European and round brilliant cut diamonds; 1.42 carats. Like the Milky Way, this 1930s vintage diamond ring casts a mesmerizing spiral of star-powered radiance. 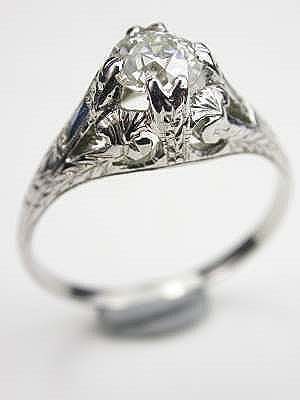 The platinum band of this 1930s vintage engagement ring has a dome setting that is accentuated with pierced swirl work. Twenty-two old style single cut diamonds highlight the swirling. 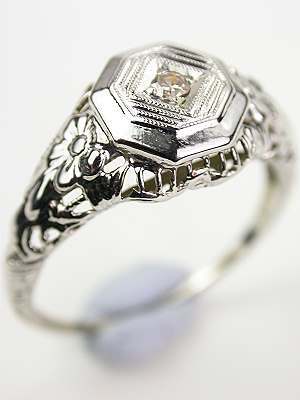 An old European cut diamond is bezel set in this vintage ring's mounting. Circa 1930. Romantic X-shaped kisses blow their way down the shoulders of this vintage engagement ring, but their kissing cousin, the hug, is not to be outdone. The kisses and hugs design of this vintage engagement ring has a collection of diamonds that accentuate this ring with an XO flair. Details: Vintage. Circa 1930. 18k white gold. Old European and single cut diamonds; 0.61 carats. In this vintage ring, a cultured natural pearl embraces an old style full cut diamond in a recreation of Rodin's romantic sculpture "The Kiss." 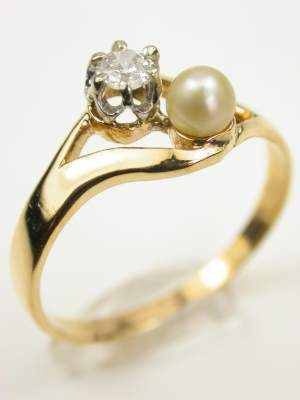 The hand-wrought, polished 18k yellow gold band of this vintage ring gleams in an open wave around its main attractions - a cultured natural pearl and an old cut diamond. Details: 18k yellow gold. Old style full cut diamond; 0.11 carats. Natural pearl, 3.9mm. Vintage, Circa 1930 or later. This 1930s vintage diamond engagement ring surprises with unexpected bursts of color. A pair of bezel-set baguette cut blue sapphires add soft color to the shoulders of the ring. The combined gemstone weight of these sapphires is 0.08 carats. Rising from the mounting's pierced scrollwork and carved wheat pattern is an old European cut diamond that is GIA certified. Circa 1930. Bold and sassy sums up the spirit of this Retro vintage engagement ring. The unusual design of this Retro ring features a pair of round brilliant cut diamonds which are bead set in the center of two highly polished squares. The 14k white gold band of this vintage ring is trimmed in milgrain and the total diamond weight is 0.29 carats. Circa 1940. 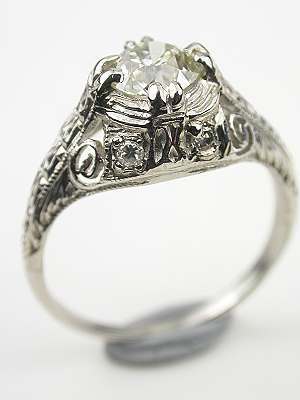 If you love this vintage engagement ring we can re-create it for you. Email us for more information. 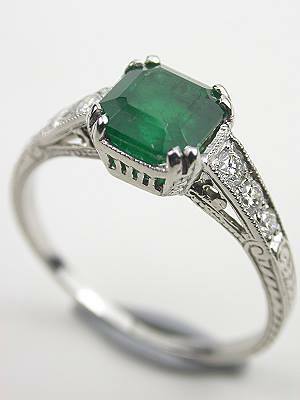 Split prongs show off a fabulous emerald in Edwardian inspired vintage engagement rings like this one. 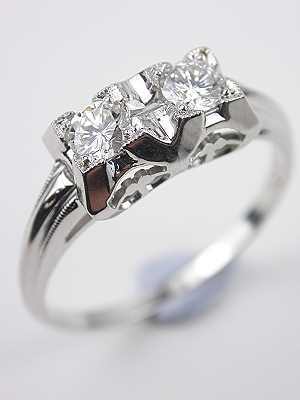 The platinum band of this vintage engagement ring is carved with a chevron design. Six round full cut diamonds, three on each side, accentuate the shoulders of the band. A square basket setting cradles an emerald-cut emerald. This blueish green gemstone weighs 1.44 carats. Circa 1930 or later. Like fire and ice, this marquise cut ruby vintage engagement ring is dazzling. 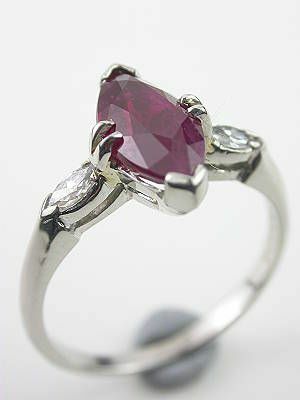 The focal point ruby in this vintage ring is purplish red in hue and is prong set in a classic platinum airline setting. This 1.39 carat ruby is flanked by a pair of accenting marquise cut diamonds. The combined weight of the diamonds is 0.12 carats. 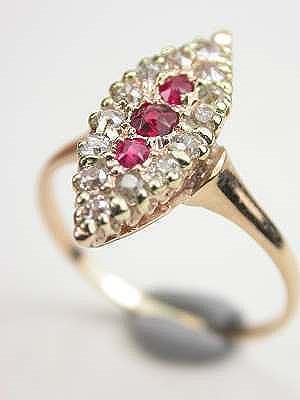 Vintage ruby and engagement rings like this one are perfect for a high spirited lady. Circa 1940s. Continued from the top . . .
"I'm a caretaker of history." You take great pride preserving the piece of posterity that is your vintage engagement ring. You'll pass this beautiful work of art down to the next generation, and you don't take this responsibility lightly. You are a guardian of the past and the future, and you know how precious of a duty this is. "I believe in tradition." When you wear your vintage engagement ring, you're making a bold statement about yourself. You're telling the world that you have no desire to be caught up in all the modern-day trappings. You value what has come before, and you see your engagement ring as a reflection of your love of tradition. "I care about preserving the environment." 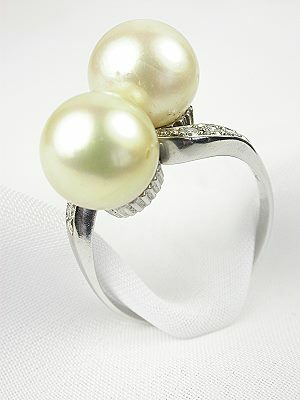 Because it is essentially a recycled piece of jewelry, a vintage ring is an eco-conscious choice. Unlike new engagement rings, the making of which requires metal, stones, and mining techniques that can negatively affect the earth, vintage engagement rings leave no additional mark on the environment. "I know who I am." You don't take cues from the media, or the current trends touted by advertising, magazines, and social media. You are your own trendsetter. You have your own sense of style, and you know how to confidently express your individuality in your own unique way. If a vintage engagement ring speaks to you, perk up your ears and listen. Choosing one says a lot about you. And those who see you wearing the ring will get the not-so-secret message loud and clear. Few things are as exciting as a destination wedding. Whether you travel afar, or stay close to home, these vintage wedding locales are sure to inspire you. And because no wedding would be complete without the perfect ring, we've paired each one of these romantic wedding venues with an antique or vintage engagement ring available from Topazery. This stone structure embodies Ireland's history. Dating back to the 18th century, Castle Durrow holds the distinction of being one of the few houses of its time for which precise building records survive. As a result, its lineage can be traced all the way back to the day it was built. Even more striking is the fact that three centuries later, this castle still stands in near-original condition. Known as the Emerald Isle, Ireland is synonymous with the color green. The perfect pairing for a wedding at Castle Durrow is a vintage wedding ring featuring emeralds. 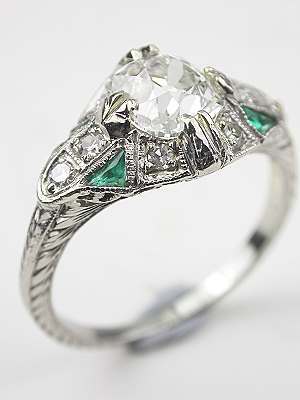 This vintage engagement ring with emerald accents, circa 1925, provides just enough hint of green to qualify as Irish-inspired. With beautiful farmland stretching in every direction, the landscape surrounding Over the Vines is as spectacular as the structure itself. Set among lush vineyards, the wine barn was built in 1888, in the midst of the Victorian era. 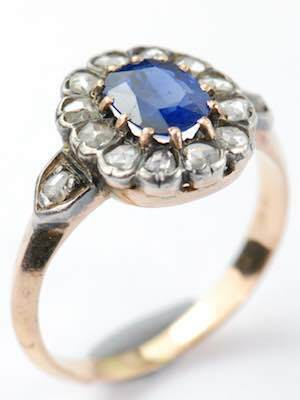 Matching up nicely with that era is this Victorian Antique Sapphire Engagement Ring. Circa 1875, this ring is the perfect complement to a wedding held at Over the Vines. Few vintage wedding venues are lovelier or more romantic than the vineyards surrounding Chateau Vaudois in the Provence region of France. Nestled near the Cote d'Azur, just north of Saint-Tropez, the Chateau affords a bride and her guests stunning views of the French Riviera and the Mediterranean Sea. Flooded with sunshine almost year-round, this vintage wedding venue is full of bright light and soft ocean breezes. A vintage ring with a vine pattern running through it is perfect for a vineyard wedding. 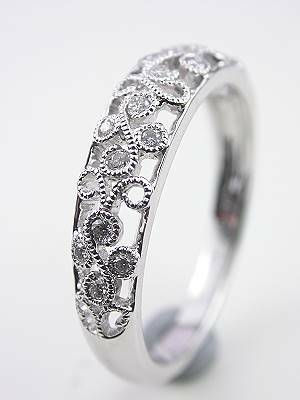 This Floral Wedding Band with Diamonds features open-work vines twisting their way down the shoulders of the ring. A collection of diamonds peeks out among the intricate scrollwork. Turrets, gables, and lacy gingerbread trim are just some of the Victorian touches that make The Victorian a spectacular vintage wedding venue. Built as a mansion in 1892, it remained in the hands of the same family for decades. The white picket fence that surrounds it makes a beautiful backdrop for wedding photos. 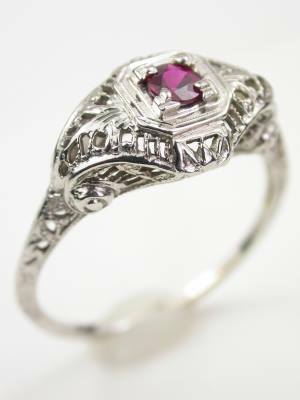 This Victorian Ruby and Diamond Cocktail Ring hails from the same decade as this lovely venue. Featuring three ruby accents down its center, the ring is surrounded by its own white picket fence in the form of 14 European-cut diamonds. Surrounded by lush, green lawns and flowering gardens, Chateau Elan Carriage House makes for a gorgeous wedding destination. The structure is built from sandstone rescued from another property built in 1834. It's unique in that it provides a roomy yet intimate space perfect for a wedding. With its hand-wrought, 18-karat gold setting, this Victorian Antique Wedding Ring evokes the past in much the same way this vintage venue does. Five European-cut diamonds streak across its center, while an English hallmark and a personal engraving give a nod to this vintage wedding ring's Victorian past. You might worry that because of your vintage engagement ring's age, it won't stand up to the rigors of cleaning. Vintage jewelry does require some tender loving care, and with a few precautions, you can keep it looking beautiful for many more years to come. Use the Right Tools - Fortunately, it doesn't take a lot of fancy gadgets to care for your vintage engagement ring. All you need is warm water, mild soap, and a soft-bristled toothbrush, all things you probably already have at home. Use the soapy brush to scrub away any dirt or residue, then rinse thoroughly. Any leftover soap will dull the stone and metal. Use a lint-free cloth - an eyeglass wipe works well - to completely dry your ring, especially if you're planning to put it away instead of wearing it. Never store your ring while it's still wet. A word of caution: This method does not work for all jewelry and gemstones. Consult With a Jeweler - Certain gemstones such as opals, pearls, coral, and even emeralds require special care. Trying to clean them the same way you would a diamond can produce devastating results. For example, pearls can be permanently damaged by brushes, even soft-bristled ones. Talk with your jeweler about the best way to clean your particular piece. Get a Professional Cleaning - To avoid unintentionally inflicting any damage yourself, find a jeweler you trust, and invest in periodic professional cleanings. This will not only keep your vintage engagement ring looking beautiful, it also gives the jeweler an opportunity to examine the piece, and alert you to any potential dangers such as loose stones, or other damage you might not notice until it's too late. Avoid Big Box Stores - While they may have the best of intentions, employees at these stores likely lack the knowledge and skill to properly care for vintage jewelry. When taking your engagement ring for a professional cleaning, be sure to visit a reputable jeweler with vintage jewelry experience. Use Ultrasonic Cleaners With Caution - These devices are not really made for vintage jewelry. The vibrations they produce can dislodge the diamonds and other gemstones from your vintage engagement ring, necessitating costly repairs, or resulting in permanent damage. 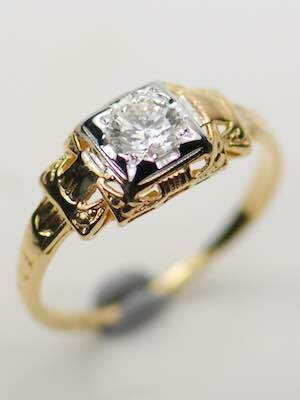 Store Your Jewelry Properly - Never throw your vintage engagement ring into a box or drawer with other jewelry pieces. To avoid scratches and nicks, keep your vintage engagement ring in its own soft pouch or padded box, or at least make sure the box or drawer where you store it is padded or lined, and that it has its own separate compartment so it doesn't rub up against other pieces. Avoid Cosmetics and Household Cleaners - Lotions, hairspray, oils, and everyday chemicals can damage your your vintage engagement ring. Always remove your ring and store it in a safe place before applying beauty products or cleaning your home. Softer, porous gems such as pearls and turquoise are especially vulnerable to damage from chemicals. It may not be enough to simply wear gloves as the gemstones may be disturbed by the friction. Avoid Perspiration - Always remove your vintage engagement ring before working out, playing sports, or even just participating in outdoor events (picnics, etc.) where you may perspire. And definitely remove your ring or any other vintage jewelry before swimming. The harsh chemicals in a pool can permanently damage your heirloom. Take Care with the Elements. Direct sunlight can cause damage, but so can the air from heating vents. And under no circumstances should you leave your ring in a hot car, or any area that is not cooled. If you must store your vintage jewelry with other belongings, try to find a climate-controlled facility. Clean Your Ring Even When it Doesn't Look Dirty - Everyday contaminants such as skin cells, hair, dust, dirt, and soap scum can build up and eventually dull or damage your vintage engagement ring. These materials can find their way under stones and into tiny crevasses, out of sight of the naked eye. If all else fails, and your vintage engagement ring is somehow damaged, there may still be hope. For added peace of mind, talk with your insurer. Some homeowners' and renters' insurance policies may include coverage for lost or damaged jewelry.